The Ladies (plus a few gents) who made up the opposition. 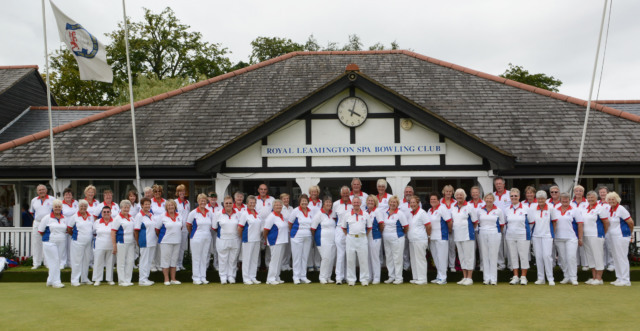 On August 11th the ‘Friends’ had their annual match against the Bowls England Ladies. It was perfect bowling weather – cloudy and warm. The greens played like a dream. The groundsmen have done a wonderful job. There were 96 players on the green and the laughter could be heard from a long way off. Despite Angela Harris playing her usual tricks of changing the stickers, so that our skip had a wrong bias, and moving the jack to a more advantageous position as she walked past the head, we still managed a good win on our rink against the B.E. President Michael Jennings. In fact we did not have a losing rink on B green. Well done to all of you. C green also came out on top. I cannot wait to see what happens on September 1st when we return to play the ‘Select Team’. After the game we moved over to the Royal Naval Association Club for our after match meal. 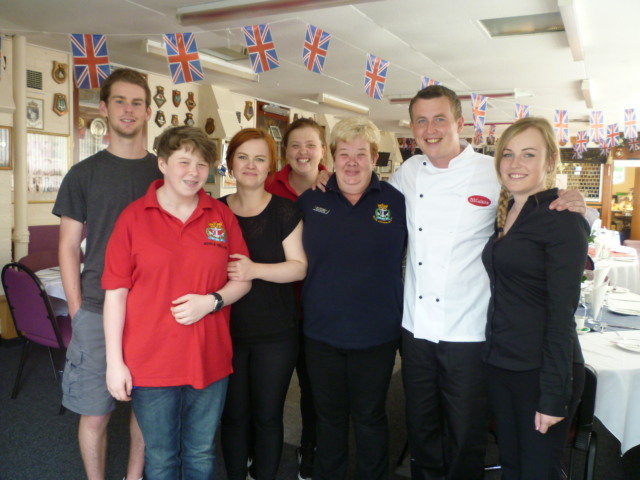 Lyn McDonnell (centre) together with Chef Nick and helpers. The top table guests walked in past a line of cadets to see the beautifully laid out picnic tables – complete with picnic hampers. The two Standard bearers, Roger Haymes and Liam Payne then presented President Michael with the flags and these were placed either side of the top table. There was lots of food to choose from, including prawn cocktail and then we tucked into the deserts. Three for each of us. Lemon syllabub, the most delicious scones with clotted cream and jam and meringues with fresh fruit and cream. (sorry there is no picture of this but it is a bit difficult when you are on top table). After the meal President Michael thanked all concerned with the day, giving special thanks to his Senior Vice Viv, who was his captain for the day and had the hard job of finding fill in players at the last moment. Prizes were then presented to the top rinks. Captain of the day, Cyndy Lee, then thanked all her players for doing so well and giving us a stupendous win. Prizes were then presented to the winning rinks from each green and wooden spoons to the highest losing rink from the ‘Friends’. The raffle then took place, which raised the amount collected so far this year for Michael’s charity to over £6,000. Michael thanked everyone for being so generous. The Standard was then officially handed back to Roger Haymes and proceedings came to an end. A wonderful time was had by all and my grateful thanks go to Adie Lloyd our match secretary who works quietly in the background making up the teams and sorting out the winners and losers and also finding replacements for last minute no shows. Not an easy job but he does it with great panache. He is ably assisted by his wife Kath, who is our hard working treasurer.